Our list of suppliers for metal kitchen counter top edging continues to grow — with the addition of Eagle Moulding, a distributor in Maple Grove, Minnesota. Eagle Mouldings’ large inventory includes a two styles of aluminum counter top edgings, in a variety of sizes. Metal counter top edging is a very popular way to inject authentic vintage style into a retro kitchen. 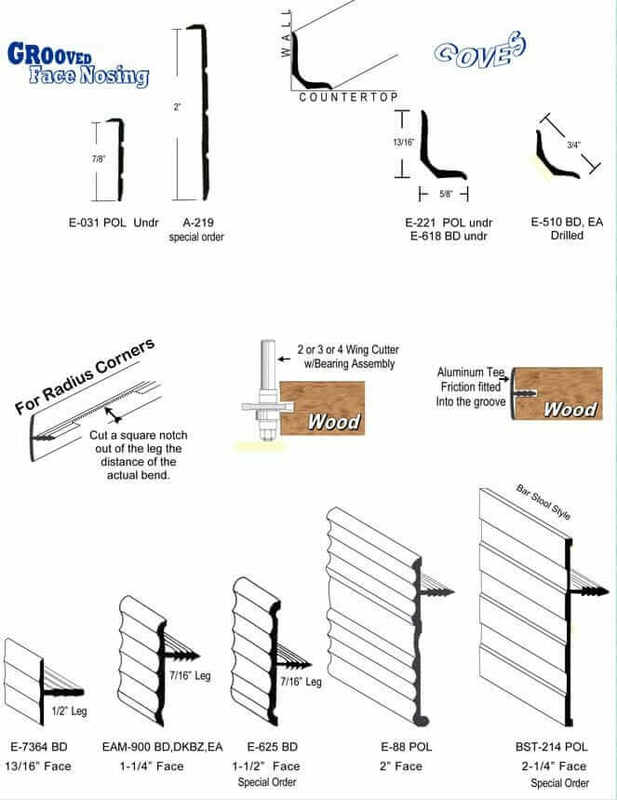 Eagle Moulding is the direct supplier to many furniture manufacturers and, in fact, I see at least one of these edgings explicitly mentioned over on the Bars & Booth moldings page. Nosing around Eagle’s website (how fun am I on a Saturday night??) I also see they have “plain face nosing”. Go nose around — I bet you’re just like me and think there is no better way to waste time than to surf through a few hundred varieties of metal trim to imagine potential uses. For example, Thor: Wouldn’t the coves above also work for our retro countertop installations???? And, this is off-topic, but before I die, I really want some slat wall. Prices are not listed on the website — you can call or email RetroTrims.com with your enquiries. 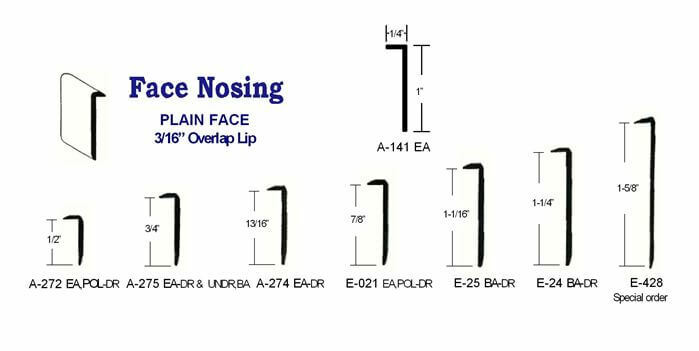 But prices are no big secret, Thor sent me the price list and as an example, the 1-1/4″ tee molding (bottom row) is just over $14 for a 12′ length. The next size up, the 1-1/2″ aluminum countertop edging is about $27 for 12′. There is no minimum $100 order — you can just order what you need. I was quoted $37.64 for a single 12 foot length of E-031. However, the shipping quote was $220 for that single unit. That’s a little too steep for my small project and budget. Mark- I am not sure where you would be shipping to, or the exact details of your request. $220 does seem pretty unreasonable. However, I do know that if you were pricing out shipping a 12′ piece of trim to your residence via long haul truck the freight would be quite high. Usually you would have been given an option to have us cut the material down to 8′ or less and ship via FedEx as well. If you are still looking for the part, please call me directly and I will do everything I can to make sure you are happy and satisfied. Hi, I need some help finding a replacement part. Can I send someone pictures to help determine what trim I need?